I was VERY excited to attend Urban Craft in Ottawa this past weekend. 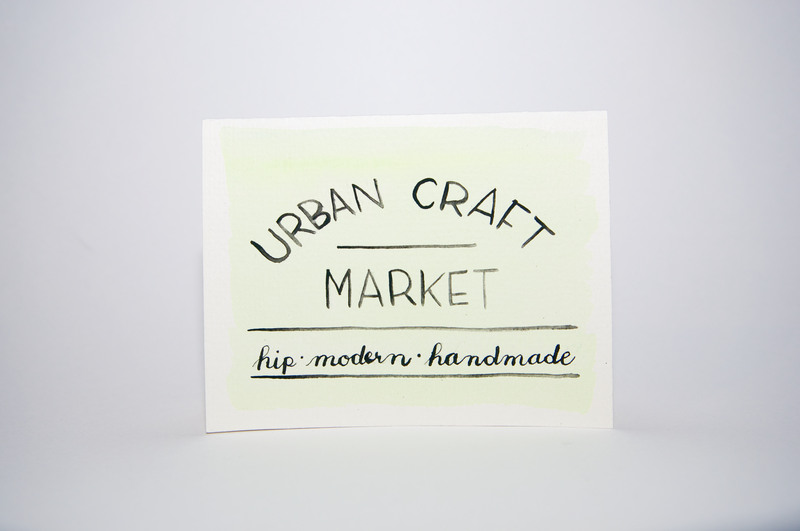 This craft show is for “hip, modern, and handmade” items! Sounds perfect, right? I decided that I wanted the full experience at Urban Craft. So I decided to sign up as a volunteer. If you can ever get involved, I would highly recommend it. You get a much better chance to meet the organizers and learn more about the behind the scenes stuff! In the morning, we pulled out the tables and chairs so that the vendors could set up their stations. After all the heavy lifting was done, then came the fun stuff! Yiseul and I were in charge of outside decorations. This included lawn signs, sidewalk chalk and colourful pinwheels!! I love love loved the sidewalk chalk. It made me feel like a kid again, plus I love all things lettering, so how could I resist?! The pinwheels were also amazing, since they caught the wind, so the colour and movement totally caught people’s attention to bring them to Urban Craft. When I got back inside, the vendors were all set up, and things started happening!! The selection of vendors there was ah-may-zing! If I could have, I would have bought soooo many things. Unfortunately (or fortunately? ), I was heading to the FIFA Women’s World Cup game (Germany vs. Sweden) afterwards, so I knew I couldn’t carry too much with me. Instead I collected business cards, and chatted with vendors. I didn’t manage to get a business card from everyone, mostly because I get distracted a little too easily, and forgot to pick up cards at every table. But I did get to talk to everyone, and most people seemed to be having such a great time! Some of my favourite people to talk to were those who really told the story of their products. Olivier from iLikeMaps, designed the software to take maps and turn them into beautifully coloured art prints. Then he gets the maps printed on cards, postcards, large prints, tote bags, pillows!! Seriously, very cool. Plus, he was nice enough to offer the volunteers a postcard or greeting card of their choice. What a nice guy! I chose London. Stéphane from Pretty River Woodwork, makes magnetic key/knife/all-things-metal blocks out of wood. He inlays magnets into beautiful cuts of wood, and they are seriously gorgeous. They showed how one of their blocks is able to hold up a cast iron skillet.. a SKILLET!! I clearly forgot to grab a business card because I was so busy talking, haha! Yoko from ART FREED, makes greeting cards and small prints (!!). I approached about starting a card and print business. She said that she was literally in my shoes one year ago, and that Urban Craft was her first ever show! Amazing! Congrats Yoko!! Her cards are so cute, too. There were also places that were so busy all day long, and I wish I had more of a chance to talk to, like Moo Shu Ice Cream, and Split Tree Cocktail Co. I also really wanted to buy everything off the tables of Des Enfantillages, Jenny Rijke, Christian Roy, and Blondie Apparel. 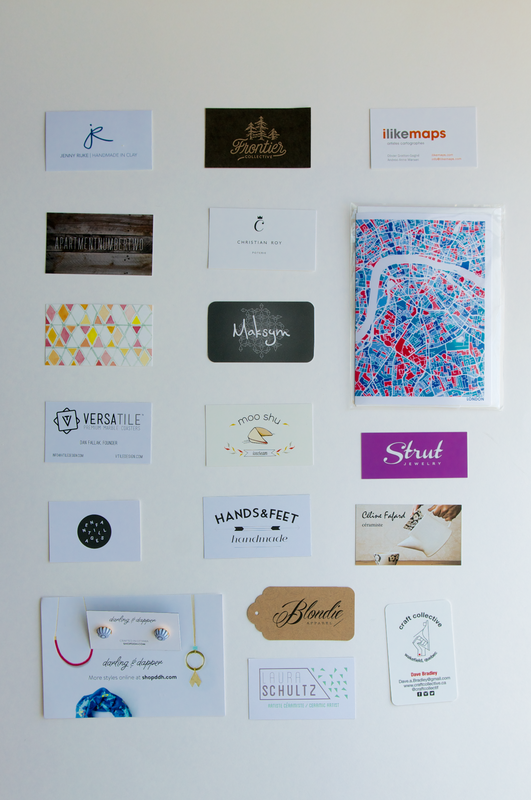 And this is only a sample of all the amazing vendors who were at Urban Craft! I was seriously amazed at the mix of things; there was definitely no shortage of talent. I can’t wait until next time!